The other day, Mr. Boomer and I were talking and I noted that even though business travel is not as enjoyable as it once there is one aspect that I enjoy. I know it’s not good for my waistline, but trying new or regional foods is fun and interesting. It’s hard to narrow down some of the regional specialties I’ve sampled but here are ten of my favorites. 10. 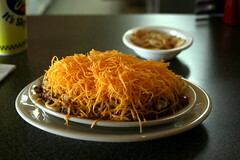 Five Way Chili – Customer’s in Cincinnati insisted on taking me to Skyline Chili to try it 5 way. I must admit I’m not a big fan but it was definitely different having chili over spaghetti noodles. The chili sauce has a unique taste as well. 9. Cheesesteak – The city of brotherly love gives us cheesesteaks. Unfortunately, I can’t remember if I had Geno’s or Pat’s although I know locals definitely have strong preferences. How could you not like a sandwich with chopped meat, cheese and onions? 8. Beer Cheese Soup – I don’t like beer but combine it with cheese and it’s great! This Wisconsin soup is even better when paired with a grilled brat. 7. Kalua Pork– Nope, this is not pork roasted with liqueur. It’s Hawaiian-style pork cooked in ground slowly and is undescribably delicious. Yes, we have business trips to Hawaii. It’s a tough job but someone has to do it! 6. 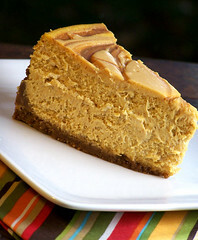 Cheesecake – New York is home to many gastronomic treats. There’s the famous delis with their enormous portions. Pizza is associated with New York. But my favorite is the cheesecake. Chocolate and pumpkin are too of my favorite flavors. 5. Shrimp Po-boys– It’s hard to pick one favorite from New Orleans but if truth be told I’m a sucker for fried shrimp so this dish wins out. Other contenders from the Big Easy include jambalaya, gumbo and beignets. 4. 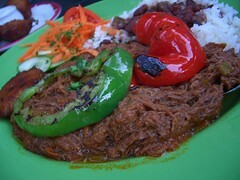 Ropa Vieja – This is my all time favorite Cuban dish and the city to find it is Miami. A plate of ropa vieja, black beans, rice and fried plaintains is the perfect meal. Add a fruity sangria to wash it down. 3. Crab Cakes – Maryland crab cakes are what’s for dinner whenever I’m near the Chesapeake Bay. I first had these lump crab meat patties on a trip to Baltimore over a decade ago and they’re still a favorite. 2. 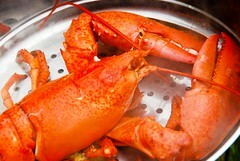 Lobster – Americans may think Maine is the place for lobsters, but Canadians know it’s New Brunswick, Canada. A client had me to her home for the best lobster meal of my life. 1. Fish tacos – I didn’t have to travel anywhere else to find the best fish tacos. This is a local specialty that’s even sold at the baseball park. This isn’t my favorite food, but there’s no place like home. My business travel is all in North America so haven’t been able to try any of your local treats. However, this continent has a lot of diversity! I’ve never had beer cheese soup nor kalua pork but I sure would like to try it!!! 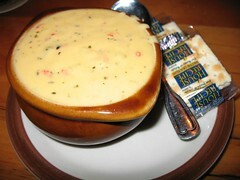 I had the beer cheese soup at a conference in Milwaukee. The theme was Wisconsin foods. For the kalua pork, I went to a luau after a day of client work. Even if it seems cheesy and touristy, attend a luau if you get the opportunity. You had me drooling…until the fish tacos. Must be a West Coast thing…? .-= RainyDaySaverÂ´s last blog ..Fix-It Friday: Our Home Improvement Wish List =-. They’re better than they sound probably. 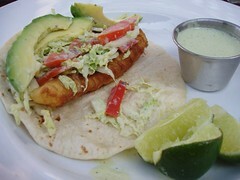 It’s just fried or grilled fish in a tortilla with cabbage and white sauce. P.S. It is definitely regional. I can’t stop starring at that cheese steak. .-= AustinÂ´s last blog ..Interview with a Location Independent Family Man in China =-. Excellent picks, all look really tasty! .-= Money ReasonsÂ´s last blog ..Are You Tracking Your Cash Flow? Youâ€™d Better Be! =-. LOL. Maybe this is why I need to lose weight! Business travel is not much fun (last week I flew all day from SD to Baltimore. Met the client for an all day meeting and then flew back that night. Not much sleep. I’m impressed you didn’t balk at the fish tacos. Look at the “Garbage Plate” from Nick Tahou’s in Rochester, NY….yummy! .-= Lakita (PFJourney)Â´s last blog ..Along the Journey Weekly Roundup #11: The Problogger Challenge Edition =-. Fun post! I’ve eaten Skyway Chili – yes, definitely a regional thing. But I liked it. If you are ever in Toledo, Ohio, you must try Tony Packo’s. .-= Monroe on a BudgetÂ´s last blog ..The corn bread recipe =-. Monroe, is that another chili place? .-= Monroe on a BudgetÂ´s last blog ..Take Partâ€™s How to eat well on food stamps =-. I’ll try it the next time I’m there. I haven’t been to Toledo in years! Hah, I’m heading to Florida on a business trip and already am making plans to hit Cracker Barrel a time or two. I wish they would cross the state line into California. 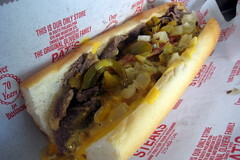 I love the philly cheesesteak….such a guilty pleasure! I think they are best in philly though. It’s not my favorite; but definitely is best there. Try Pudge’s just outside Philly in Blue Bell for cheesesteak. Tons better than Pat’s or Geno’s. I agree, Andrew. Nothing better than a cheesesteak from Philly! Even the ones from the lunch trucks out there serve really good ones. Len, I’m not a big fan of them but agree no one does it better than Philly! Since they’re only a hop, skip, and jump from here, i have to vote that Pat’s is way better than Genos…but both are fantastic….any cheesesteak is better than no cheesesteak. 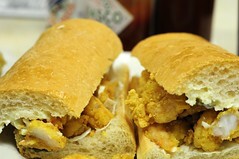 Also “mother’s” has some of the best po-boys in N.O.! I think I ate at Mother’s in N.O. It was pretty good and a unique atmosphere.